Someone can erroneously say, "The Laws helmet looks much too narrow. The AA/SDS is clearly the winner." I'm not saying that anyone has said this in the course of this thread. However, I need to point out that because the two helmets are photographed at different distances and because Jez photographed the AA/SDS closer than Travsall did with his Laws, this is a false positive. This is not an apples-to-apples comparison. The proportions of the above AA/SDS are distorted due to the closeness of the camera, and this will affect anyone's photo analysis. Here, you can see both Jez and Travsall (of RPF) both have the same Laws helmet. However, because Jez is too close to the helmet, the proportions of the dome and facemask are different than that of Travsall's photo. This is why it's important for us to standardize on a 5 foot distance. It reduces the perspective distortion and gives us a far more accurate sense of the proportions. Once Jez gets his 5 foot photo up and at a similar vertical tilt to Travsall's photo, then I think we'll get a better sense of the facemask and dome proportions and can begin comparing them correctly. The important thing is: which helmet has the truest proportions to the screen used helmet. ALSO, movie cameras are very rarely 2-3 feet away from the helmet props, so when you compare even an AA/SDS photographed 2-3 feet away against the ANH TIE Pilots where the cameraman was, say, 12 feet away, the comparison is, once again, flawed. By the looks of things the Laws is noticeably smaller than the SDS. The more I look at the Laws the more I think the APH part came from a DP deluxe or maybe even a Classic action. This may account for the 'ear' parts being formed as part of the APH helmet as opposed to being a separate part like the SDS and IH. What was the distance between you and the camera when taking these shots? Almost exactly 5ft (I know this as I'm stading near the place I took them now) - not the best place but the lighting was good. I'm normally at least 6ft away but at least in this case both helmets are side by side so any lens distortion will affect both helmets. So to recap,l I'd say that this pic proves that the Laws is quite a bit smaller (esp narrower) than the SDS - we all agree on that yes? From the pictures shown here, then the Laws helmet looks narrower and a slight bit smaller than the SDS helmet, from what I can see. The goal of this thread is to determine which helmet is screen-accurate in proportions. It's becoming, "Helmet B is narrower than Helmet A and therefore Helmet A wins". I feel this would be an erroneous conclusion because we never substantiated why Helmet A should even be a valid and accurate baseline of comparison in the first place! 1. The statement was made that the IH was the most accurate, so I'd like to see this substantiated. Accurate in what sense? 2. 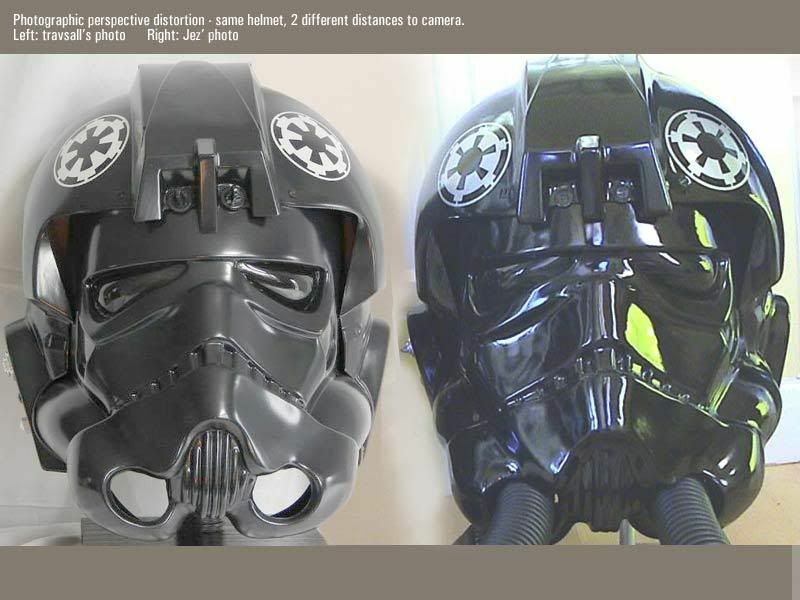 If we are trying to compare the Laws helmet against a screen-used helmet to determine accuracy, it simply does not make sense to compare it against an SDS because it's already established the SDS TIE Pilot as a whole was not used on the screen but was reconstructed and even Bingo has issue with the mohawk. 3. It is argued that the SDS faceplate is accurate. I'd like to see that substantiated, and so far no-one has stepped forward to address my request (the third time now) concerning mold deterioration and deformation. In plain English: are helmets cast from the molds today absolutely identical to the 1977 helmets? If the molds have become deformed over the last 30 years, then the answer is NO, and then it is impropr to use an SDS Tie Pilot's face as a baseline. 3.a. Even if it were determined that the mold suffered no deterioration or deformation over the last 30 years, simply because the Laws' face is narrower, it still doesn't mean the SDS is the holy grail of TIE Pilot helmets because the mohawk has been reconstructed. In other words, Mr. Ainsworth does not have a "TIE Pilot mold" and has had to scratch-build a TIE Pilot with what he currently has and there for the TIE Pilot he offers is not fully historical. 3.b. Bingo point out accuracy problems with the SDS mohawk. So if one part is accurate and another part is not, then the helmet wholistically is inaccurate. This would be true of Vader if someone took an ANH facemask and scratch-built a ROTJ dome. You can argue all you want the facemask is accurate, but the entire helmet is collectively the facemask plus the dome, so using the entire helmet of the SDS TIE Pilot as a baseline is not the right thing to do. I've also noticed that not only the mohawk is higher on the SDS, but there is a neck-buldge or neck flare of the opening. The prop does not have this. As a control, here is a Christy's helmet that does not have a neck flare either. Rather, the neck liner is flush with the surface of the underside of the cheek buldges. So that's two aspects of inaccuracy on the SDS: the mohawk and a "neck flare". Thats cos we're only part the way through! Ive now got hold of the pics I wanted to show so these should help. These pics were taken in 2004 when I had access to the original TIE and a Laws/Anon/whateveryouwanttocallit helmet AT THE SAME TIME so are side by side. I didnt take any more as I only took these as a bit of fun. tbh the replica helmet felt like a toy next to the original as it didnt have any of the gravitas present on the original. NOW WHAT WE DONT HAVE is an SDS sitting next to an original, but hopefully one day we will. However IMO the fact that the LAWS seems small and thin next to the original, yet the SDS seems big and fat next to the LAWS, suggest that the SDS could be right. If we believe (and some dont) that the SDS is from the original moulds then that also backs up its case. See above for first part. I disagree the second part that the SDS is reconstructed. 3rd part - mohawk - agreed. I've tried to answer this. The reality is WE DO NOT KNOW what state the moulds were in when filming ended in 1976,compared with when production started in 2004. Like Anson said I DOUBT the mouds have deformed, but could have been damanged (at some time), or even modified - but we just dont know. Sorry but IMO we should discount the Laws and concentrate on the SDS and IH - IMO the pics above suggest to me that the proportions of the laws are wrong. 2nd part, imo AA DOES have "TIE Moulds" as these are the same as they were in 1976 - i.e. a stormtrooper faceplate (with hole blocked in), andf the XWing hemispheres. 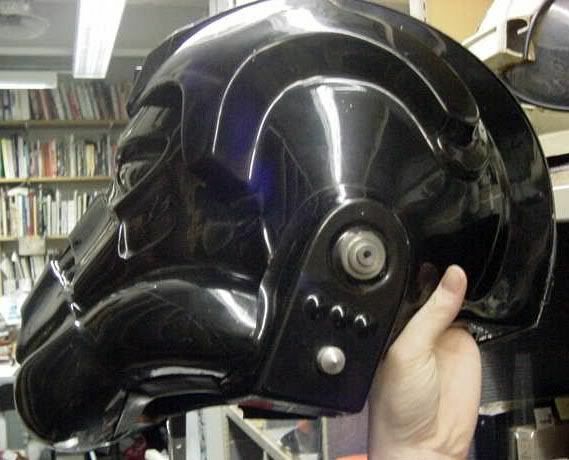 there were never any "TIE Moulds" as such - its just a mixture of other helmet formed parts, done in a different colour. This is about personal preferences. 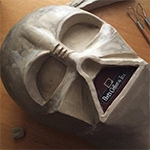 IMO I would rather have a Vader cast from the original moulds WITH a fault like the widows peak - than a 2nd or 3rd gen helmet with less overall "connection" to the original. But we all have our own preferences and opinions on this one so there's no right or wrong. Just signed up, I'm the owner/builder of the Law's helmet being compaired, and wanted to add a few of my thoughts to the mix. Real interesting topic and compairison, I've picked up a few great pieces of info while reading, and I researched the hell out of the TIE before buying. Always been one of my favourite costume designs, really visually stunning in the movies, and we do have Ainsworth to thank for that, if his design wasn't as eye catching as it was, the TIE shots would have been over the shoulder. I think the main point on this whole discussion is always going to be argued, as it comes down really to personal preference, and what you take in as right, or accurate. Everyone takes their own ideas away from each character, 2 people can watch the same scene, the same costume and take 2 different opinions away from how it looked. Having the original helmet to compair to is fantastic, and adds that extra oomf, but there will always still be the preference issue, you gravitate to what you like, and find fault in what you don't. I spent a LOT of time looking at TIE helmets before I went with Law's, I'd wanted a set for YEARS before I finally got one, I went with Dan's because to me, it struck as the epitomy of what I saw on screen. In terms of accuracy, I'd put it up there, WAY up there, it's definitely got the right look, the same sleekness and stance, and looking at my helmet, I can't help but see the movie. There are a few differences though, some I find for the better. Mainly, the Law's is a little smaller then the screen used, not by a lot, but enough to spot for sure. The other big difference is in the ear caps, the Law's helmet has them molded to the side sections, where the screen used they were seperate pieces glued on. So, in a way that kinda rules it out as the most accurate right there, those 2 things kill the arguement in a way, and SDS would "win" from that. However, I don't think anyone is that cut and dried in a discussion like this, it's going by looks and feel, perceptions, and in that case, I'll take the Law's over everything else. As for my opinion, I am biased, in a few ways. I'm not that big a fan of SDS, what he's doing is really neat, and damn nice for the fans, using the original molds, and putting out some incredable pieces. I was swayed by a couple things though, the price, the stories I'd heard about quality control (which I believe have been worked out, but first impression is the one that sticks) and to me, some of the helmets do look off, the TIE and Hero most notably. Also, Dan is a friend, so I am going to see his work in a little different light, can't be helped. To me though, the SDS just doesn't look right, doesn't look how I saw the TIE pilots, it seems almost chubby, too squat, and doesn't give off that intimidating 'evil' glare that caught my attention. The neck is off, and the mohawk stands out like a sore thumb compaired to the screen used. It's a nice helmet, the price tag is DAMN steep, but it is a nice helmet. When I saw the new Law's helmet the first time, I believe the one I have is the 3rd incarnation, it hit me the same way the movies did. Dan sent me a pic of one he'd put together, before paint, and lenses, sitting on his steps, and from that my jaw dropped. It had exactly what I was looking for, the stance, the sleek evil look, everything I'd been looking for. A few small discrepencies I think make the helmet almost more accurate, to the idea of the sceen used helmets anyways. The size puts it in perfect proportion when it's worn, bigger, and you tend to get a little bobble headed looking. The face plate is a tad thinner, and it does give off a LOT better appearance of being taken from the stunt helmet molds, and slapped in the APH shell. It gives off that Trooper look better, not as warped and stretched. It all comes back to personal preference, to me, for my money, the Law's far and away is my favourite. Welcome to The Den travsall and your thoughts are appreciated. In this, it will always be personal preference that determines what one likes the best, whether it be a less than accurate but having THE FEEL helmet or an über accurate that lacks what you remember seeing... or the one the is both accurate and has THE FEEL. It is all individual, as we are all individuals, and as you say, we see different things... and the point of this place is to be somewhere where your opinion and preference is accepted and respected, while still not necessarily agreeing, if you know what I mean. There is no reason to get all bent out of shape because of these things, as it's supposed to be a fun hobby... and if people would just remember that and not get all pissy and resort to name calling when they feel their opinion is more important or if targeted... then it could be more pleasant. So I agree that bias is a big part of this... and we should all go after the stuff we like, without fearing being shot down by other people having other opinions. And it is a nice helmet you got there, no doubt about it! Really hope you'll like your stay here and will join in on the discussions when you feel you got something on your mind... or the OT section for the more whacky stuff. Also, you can properly introduce yourself here, if you want... http://www.aokforums.com/thepropden/thepropden-forum-12.html no pressure, though it could be nice to hear who's behind the username. For my money the SDS is the closest to the on screen helmets followed very closely by the IH they both look proportionally correct to me. The Laws looks slightly too narrow and overall slightly undersized. All three are fantastic work though and i would love to own them all one day. The Laws helmet looks very nice but the faceplate looks too much like a stunt ANH trooper. The screen helmets looked more like the Hero faceplates. The SDS looks brilliant apart from the trident on the mohawk the actual top part of the helmet and mohawk is perfect including the chip in the mould which can be seen on the screen helmets and X-wing pilot helmets (as they are the same mould). The helmet made by Anson's friend IH is really nice in almost every detail. I visited IH when I lived in Ireland and compared his with my SDS. They are clearly not the same as each other when next to each other. The IH had a slightly softer faceplate which I think IH was possibly going to work on after seeing the SDS (which he was impressed with). The top part of the helmet was excellent and the trident on the mohawk was perfect. The size was also very impressive on the IH. There were a couple of small details missing on the IH compared with the SDS you wouldn't see unless you had them both in hand. Hopefully IH could work on them as well. IH is a really talented prop maker who had some awsesome props when I visited. The scratch built models he made were fantastic but that is for another thread I suppose. A really nice guy with a lot of talent. If IH does ever make any I want 2 one for a TIE and one for an ATAT. 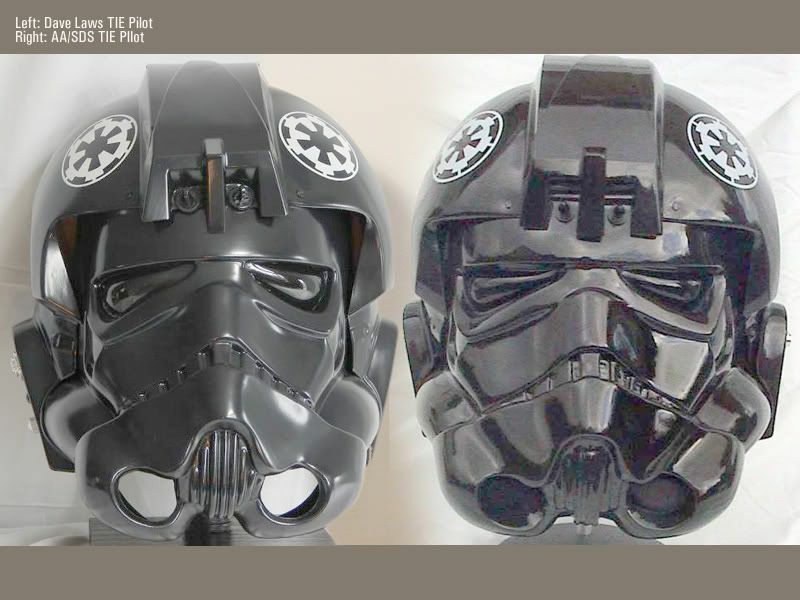 Here is a couple of pre-production snaps of the TIE helmet for comparison help and for fun. Chris, did you manage to do any side by side photo comparisons of the IH and SDS?